The Real Estate Board of Greater Vancouver has a Listed vs. Sold section on their website which graphically represents the comparison between number of units listed vs. number of units actually sold. You have the ability to select a neighbourhood and property type within that neighbourhood to get a visual representation of that data in a graph format. 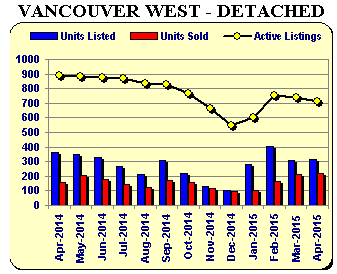 Below is an example of the Vancouver West - Detached statistics. The graph displays data for a one-year period and displays the following information on a month-to-month basis: units listed, units sold and active listings. To check out other neighbourhoods and property types, take a look at their website here.